Judge Blocks Prayer from NC County Meetings – US – CBN News – Christian News 24-7 – CBN.com. via Judge Blocks Prayer from NC County Meetings – US – CBN News – Christian News 24-7 – CBN.com. Muhammad and Culture: What to do about the enduring problem of the infidel! The World’s Muslims: Religion, Politics and Society – Pew Forum on Religion & Public Life. In other words, God is using some aspect of all of the Church’s approaches throughout history to bring about His purposes. There is the negative idea of the Church essentially rejecting the culture and intentionally isolating itself from those it views as worldly; a fortress approach. Niebuhr said, “For the radical Christian the whole world outside the sphere where Christ’s Lordship is explicitly acknowledged is a realm of equal darkness.”2 This is actually an adequate description of the way the average evangelical Pentecostal Christian views the spiritual condition of the world. 15 Do not love the world or anything in the world. If anyone loves the world, the love of the Father is not in him. 16 For everything in the world—the cravings of sinful man, the lust of his eyes and the boasting of what he has and does—comes not from the Father but from the world. 17 The world and its desires pass away, but the man who does the will of God lives forever (1 John 2:15-17). 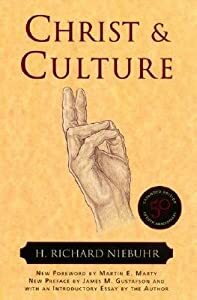 But there is also the perspective that to some degree the view of Christ against culture is necessary to help the Church formulate its proper approach to the culture. So the Christ of culture approach seems to be the bottom-up, humanist, liberal, social gospel approach that values human culture as it finds it. Cultural Christians accommodate Christ to culture. Imagine, if you will, an American culture marked, not by the search for pleasure but by the search for truth. Not necessarily a Christian America, but a non-hostile America, willing to have a conversation. This is part of what would be necessary in order for us to take a Christ above culture approach. The other necessary ingredient would be a patient, unified, Bible-believing Church whose power is not located in its political prowess but rather in its genuine connection with the Living Lord. There are two prophetic passages of Scripture that I think elicit the same kind of winsome hope for what is possible. This is what Isaiah son of Amoz saw concerning Judah and Jerusalem: 2 In the last days the mountain of the Lord’s temple will be established as chief among the mountains; it will be raised above the hills, and all nations will stream to it. 3 Many peoples will come and say, “Come, let us go up to the mountain of the Lord, to the house of the God of Jacob. He will teach us his ways, so that we may walk in his paths.” The law will go out from Zion, the word of the Lord from Jerusalem. 4He will judge between the nations and will settle disputes for many peoples. They will beat their swords into plowshares and their spears into pruning hooks. Nation will not take up sword against nation, nor will they train for war anymore. Many years ago my brother had a dream that was profound and one which I have never forgotten. It was simple, suddenly great trees grew up around the church, so high that the tops of the trees disappeared behind the clouds and fruit from their branches hung back down through the clouds; great pieces of fruit able to feed the nations! People came form miles around just to be fed by this supernaturally occurring fruit. This is my interpretation of Christ above culture: an orthodox doctrine adhered to by a non-compromising Church that at once follows Christ and yet loves the people of the culture and that very patiently and methodically allows Christ to use her to lift the culture above its own lofty goals of philosophy and purpose to a fresh revelation of truth in Jesus Christ. This approach also entertains the idea of morality as a gateway to a higher contemplative thinking, in which God leads the seeker of truth preveniently into a genuine revelation of Jesus as the Christ. 1 Niebuhr, Christ and Culture, 2. 6 Miroslav Volf, “On Loving with Hope: Eschatology and Social Resposibility,” Transformation, July/September 1990, 30. 7 Bell, Rob (2011-03-15). Love Wins: A Book About Heaven, Hell, and the Fate of Every Person Who Ever Lived (Kindle Location 611). Harper Collins, Inc.. Kindle Edition.